We present a protocol for concurrent collection of EEG/fMRI data, and synchronized MR clock signal recording. We demonstrate this method using a unique paradigm whereby subjects receive ‘cold glove’ instructions during scanning, and EEG/fMRI data are recorded along with hand temperature measurements both before and after hypnotic induction. Douglas, P. K., Pisani, M., Reid, R., Head, A., Lau, E., Mirakhor, E., Bramen, J., Gordon, B., Anderson, A., Kerr, W. T., Cheong, C., Cohen, M. S. Method for Simultaneous fMRI/EEG Data Collection during a Focused Attention Suggestion for Differential Thermal Sensation. J. Vis. Exp. (83), e3298, doi:10.3791/3298 (2014). In the present work, we demonstrate a method for concurrent collection of EEG/fMRI data. In our setup, EEG data are collected using a high-density 256-channel sensor net. The EEG amplifier itself is contained in a field isolation containment system (FICS), and MRI clock signals are synchronized with EEG data collection for subsequent MR artifact characterization and removal. 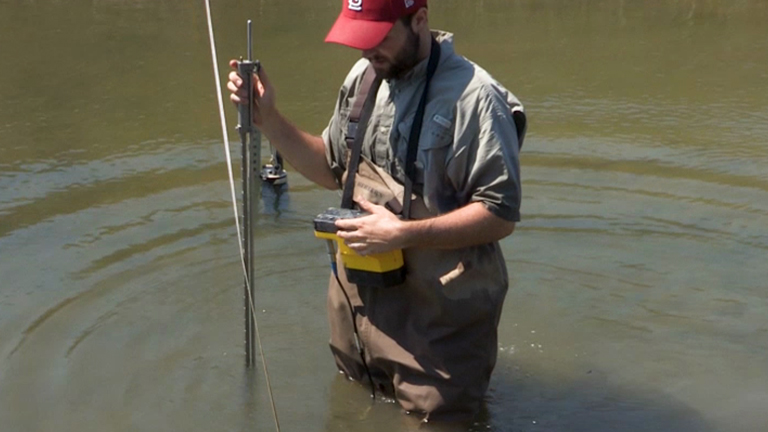 We demonstrate this method first for resting state data collection. Thereafter, we demonstrate a protocol for EEG/fMRI data recording, while subjects listen to a tape asking them to visualize that their left hand is immersed in a cold-water bath and referred to, here, as the cold glove paradigm. Thermal differentials between each hand are measured throughout EEG/fMRI data collection using an MR compatible temperature sensor that we developed for this purpose. We collect cold glove EEG/fMRI data along with simultaneous differential hand temperature measurements both before and after hypnotic induction. Between pre and post sessions, single modality EEG data are collected during the hypnotic induction and depth assessment process. Our representative results demonstrate that significant changes in the EEG power spectrum can be measured during hypnotic induction, and that hand temperature changes during the cold glove paradigm can be detected rapidly using our MR compatible differential thermometry device. Since its inception, there has been considerable controversy as to what hypnosis is, and how exactly measurable physiologic changes in susceptible individuals are produced. Studies aimed at understanding the neural correlates of hypnosis and responses to hypnotic suggestion have generally produced varied results1, which may be due, at least in part, to differences in hypnotic induction and suggestion techniques2, thus providing motivation for a detailed methodology and protocol description. Although hypnosis has conventionally been defined as a state of inner concentration and focused attention1,3, a more complete operational definition also includes: diminished awareness of exogenous stimuli4, increased absorption5, or effortless attention to words of the experimenter and diminished spontaneous thought6. A hypnotic induction is generally defined as a set of verbal instructions that facilitate hypnosis and absorption6. Hypnotizability varies greatly between individuals, but is generally stable within individuals over time7,8; suggestibility is typically measured in terms of behavioral response to suggestion with the most commonly applied metric being the Stanford Hypnotic Susceptibility Scale, (SHSS) form C9-12. Studies that examine the neural correlates of hypnosis generally fall into two categories. Either they examine networks of activity intrinsically activated during 'resting state' hypnosis, or they study changes in neural activity that occur in response to hypnotic suggestion6. In a recent EEG study, highly suggestible individuals were found to display higher event related desynchrony of the frontal-parietal network in the alpha-2 band during hypnosis compared to low suggestible subjects4. Recently, functional magnetic resonance imaging (fMRI) has also revealed changes in anterior default mode networks during 'resting state' hypnosis without a corresponding increase in activity in other brain areas2. Converging evidence suggests that hypnosis is associated with dissociated anterior attentional control13. Changes in fMRI blood oxygenation level dependent (BOLD) signals in response to a variety of hypnotic suggestions have also recently been reported14-23. The majority of suggestion-response studies correlate brain signal changes with subjective ratings of altered perception. However, hypnotic suggestion has also been used to alter physiologic parameters such as blood pressure, heart rate, and subject hand temperature in response24. Here, we extend these earlier findings by developing an experimental paradigm, referred to here as the 'cold glove' paradigm, whereby subjects are directed to perceive that one of their hands is colder in temperature than the other, in absence of any external physical manipulation of temperature. These verbal instructions are delivered via MR compatible headphones during data recording. In the present work, we first demonstrate our method for simultaneous EEG/fMRI data recording. We then demonstrate the cold glove paradigm, which includes collection of EEG/fMRI data along with hand temperature measurements both before and after hypnotic induction. Our method for hypnotic induction includes an ideomotor suggestion described by1, followed by a depth assessment using the SSHS, form C. We detect reliable changes in the EEG power spectrum that occur following hypnotic induction. We also demonstrate that our MRI compatible differential thermometry device is capable of measuring hand temperature changes during simultaneous EEG/fMRI data collection session. This procedure may provide important quantitative EEG/fMRI measurements in assessing brain signal changes that occur during intrinsic 'resting state' hypnosis as well as measuring signal changes in response to hypnotic suggestion for altered thermal perception. The following experimental protocol was reviewed and approved by the UCLA Institutional Review Board. Prior to commencing the experiment, subjects underwent a phone prescreening that excluded subject that were potentially pregnant, under the age of eighteen, or who had worked in a machine show or otherwise had metallic implants. Left-handed subjects, or those with a history of mental illness were also excluded from the subject pool. Included participants were then instructed to abstain from caffeine, drugs, and alcohol on the day of the experiment. Written informed consent and comprehension of consent was obtained from each participant on the day of the experiment. The EEG data are recorded using a 256-channel MRI compatible Geodesic Sensor Net. Impedance levels in electrodes should be monitored (step 1.5) at approximately 20 min intervals throughout the experiment to make sure that electrodes have not dried out and that impedances remain below threshold. Determine proper net size by measuring the head circumference from the glabella brow ridge to approximately 2.5 cm above the inion. HydroCel Saline potassium chloride electrolyte solution was made according to EGI instructions. EEG Electrogeodesic 256 sensor net was then soaked in electrolyte solution for 10 min. The vertex, or Cz, point on the head was determined by measuring the midpoint between nasion and inion and aligning this with the midpoint that dissects the preauricular points. The EEG net was then placed such that the Cz reference electrode aligns with the vertex point. We collected photographic images of the head and electrodes using the EGI Geodesic Photogrammetry System (GPS) in order to calibrate the sensor space to be used in EEG source analysis. Electrode impedances were then measured. Contact with the scalp was checked for those electrodes with impedance levels above threshold. The electrodes placements are adjusted, and additional electrolyte solution was added to electrodes as necessary to reduce the impedance. After the EEG net is applied appropriately, the subject proceeds to the MR scanner room. All metal objects are removed. Structural MRI and functional MRI scans are collected on a Siemens Allegra 3T scanner. Simultaneous EEG/fMRI data is collected prior to hypnotic induction in order to establish a functional baseline for each subject. T2 Matched Bandwidth - a specialized scanning sequence designed to provide good contrast for image registration, while sharing the same metric distortions as the functional scans that follow. Functional Scan - T2*-weighted echo-planar pulse sequence with a TR=2.5 sec, TE=40 msec, Field of View=200 mm x 200 mm, Flip Angle=90°, collecting whole brain images with a resolution=64 x 64 x 28, voxel size=3 mm3. Data are collected for a total of five minutes. EEG data are concurrently recorded using an MR-Compatible Electrical Geodesics (EGI) 256-channel system during the five-minute functional MRI recordings to establish a baseline EEG prior to the hypnotic induction. Our lab has pioneered methods for simultaneous fMRI/EEG collection using software and hardware that removes MR artifact and balistocardiogram noise, in real-time (see reference25 for additional details). After the resting state scan, subjects listen to a tape that instructs them to visualize that their left hand is immersed in a bucket of cold ice water. Temperature differences between each hand are quantified using our differential thermometry device described below. Subjects were then seated comfortably in a dimly lit, quiet room. EEG data were recorded throughout the duration of the hypnotic induction and progressive relaxation deepening technique. Hypnotic induction began with a brief interview by the hypnotherapist to determine subject specific spatial cues that cause relaxation. Subjects were then asked a number of questions to determine if they were capable of visualizing. The hypnotherapist then began the induction using an ideomoter suggestion known as the arm raising technique. During this time, the hypnotherapist continually gave the subject the suggestion that their arm felt as though it was getting lighter, and at some point their arm would rise in the air automatically without volitional effort. After the subject's arm elevated, they were then instructed to bend their arm and touch their forehead with their fingertips. As soon as the subject complied, the hypnotherapist asked the subject to close his or her eyes and relax as if in a deep sleep. Level of hypnotic susceptibility was then assessed via the 12-point Stanford Scale of hypnotic susceptibility, form C test. A deepening technique, in the form of a progressive relaxation, was then used to bring the subject into a greater level of hypnotic depth. EEG data are recorded throughout the hypnotic induction in a dimly lit copper shielded room during the hypnotic induction. Following hypnotic induction and progressive relaxation, the subject, again enters the MRI scanning room with the MR compatible EEG sensor net in continually in place. At this time, temperature sensors were taped onto the medial portion of both wrists. Wristbands were then placed over the taped temperature sensors to help stabilize placement. Temperature sensors should be configured according to the schematic in Figure 2. Calibration was performed prior to the experiment, and was accomplished by immersing sensor tips in two solutions of varying temperatures (37 °C± 5). Sensor output was checked against thermometer readings. The subject then listens to a prerecorded progressive relaxation tape made by the hypnotherapist via MR compatible headphones. During this time, fMRI data are collected according to pulse sequences described in step 1.1, with concurrent EEG recording. Collection of resting state EEG/fMRI data following hypnotic induction proceeds according to steps 2.2-2.4. The hypnotherapist then administers the 'cold glove' suggestion for the subsequent EEG/fMRI data collection, which again proceeds according to steps 2.2-2.5. During the suggestion, the hypnotherapist repeatedly asks the subject to visualize their hand is immersed in a cold water bath, and to imagine that their left hand was growing progressively colder from fingertips to wrist. Differential thermometry measurements are recorded throughout this block. Figure 1 shows the EEG power spectrum in a representative channel (Figure 1a) averaged over 1,000 msec in a single subject during the alert wakeful period that preceded hypnotic induction (Figure 1b). It should be noted that the patterns here follow the characteristic inverse relationship between power and frequency (f), with falloff at 1/f. Figure 1c shows the power spectrum taken from this same subject following hypnotic induction and a deepening technique. Attenuation of power can be seen in EEG theta and beta subbands, and the overall plot no longer follows 1/f. 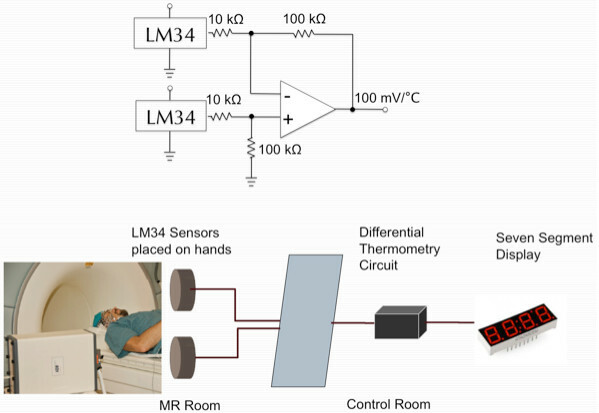 Figure 2 shows our schematic for an MRI compatible temperature sensor, which uses LM34/LM35 precision temperature sensors coupled to an Arduino device. Figure 1. Electroencephalogram (EEG) power spectrum in a single subject for a representative electrode channel. (a) 255 channel EEG electrode array with the spatial location of the channel selection for the power analysis marked in blue (b) EEG power spectrum prior to hypnotic induction, and (c) power spectrum in the same electrode channel following hypnotic induction and a deepening technique. The bar at the top, right corner of Figure 1c indicates the legend for each EEG subband with frequencies: delta (0.1-4 Hz), theta (4-8Hz), alpha (8-12 Hz), beta (12-20 Hz), and gamma (frequencies above 20 Hz). Figure 2. Schematic of the MRI compatible differential temperature sensor configuration. (above) Differential thermometry circuit, (below) overview of thermometry measurement process. There appears to be wide variability in suggestion methods used to induce subjects into a state of hypnosis1. We demonstrate here that a suggestion for nonvolitional motor movement followed by the SHSS, form C, can be used to alter EEG power spectrum. We note that although the subject used in this study had been hypnotized in the past, there was no attempt made via Harvard Group Suggestibility Scale or other mechanism to find a highly susceptible subject. We hypothesize that the magnitude of changes in EEG frequency subbands likely varies according to subject level of susceptibility, as has been reported4. We also demonstrated a setup to measure hand temperature fluctuations that may occur during a concurrent EEG/fMRI session. Although subjects can eventually learn to accomplish hand temperature changes without hypnosis using biofeedback cues, this typically takes many training sessions26. Frischholz and Tryon26 were unable to replicate the association between changes in hand temperature and hypnotic depth using the cold glove suggestion paradigm, contrary to that reported by others27. Additional work is required to resolve this controversy. Nonetheless, the method for measuring hand temperature changes during a functional neuroimaging session may prove useful in assessing the neural correlates of the hypnotic 'cold glove' suggestion following hypnotic induction. This work was supported by funds from the Korean Basic Science Institute (KBSI) grant, Neuroimaging Studies of Hypnotically Induced Deception. Kirsch, I. Hypnosis and Placebos: Response Expectancy as a Mediator of Suggestion Effects. Anales de Psicología. 15, 99-110 (1999). McGeown, W. J., Mazzoni, G., Venneri, A., Kirsch, I. Hypnotic induction decreases anterior default mode activity. Conscious. Cogn. 18, 848-855 (2009). Karlin, R. A. Hypnotizability and attention. J. Abnorm Psychol. 88, 92-95 (1979). Terhune, D. B., Cardeña, E., Lindgren, M. Differential frontal-parietal phase synchrony during hypnosis as a function of hypnotic suggestibility. Psychophysiology. (2011). Tellegen, A., Atkinson, G. Openness to absorbing and self-altering experiences ("absorption"), a trait related to hypnotic susceptibility. J. Abnorm. Psychol. 83, 268-277 (1974). Oakley, D. A., Halligan, P. W. Hypnotic suggestion and cognitive neuroscience. Trends Cogn. Sci. 13, 264-270 (2009). Kihlstrom, J. F. Hypnosis. Annu Rev Psychol. 36, 385-418 (1985). Piccione, C., Hilgard, E. R., Zimbardo, P. G. On the degree of stability of measured hypnotizability over a 25-year period. J. Pers. Soc. Psychol. 56, 289-295 (1989). 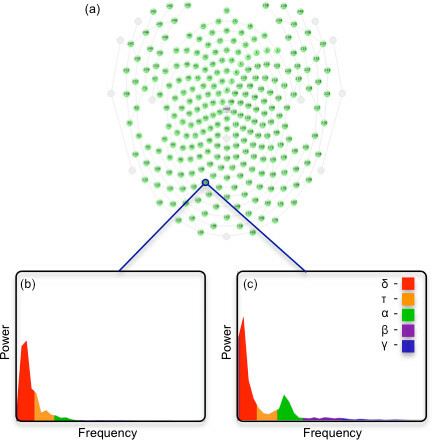 Weitzenhoffer, A. M. Estimation of hypnotic susceptibility in a group situation. Am. J. Clin. Hypn. 5, 115-126 (1962). Weitzenhoffer, A. M. The significance of hypnotic depth in therapy. Int. J. Clin. Exp. Hypn. 10, 75-78 (1962). Hilgard, E. R. The Stanford Hypnotic Susceptibility Scales as related to other measures of hypnotic responsiveness. Am. J. Clin. Hypn. 21, 68-83 (1978). Weitzenhoffer, A. M., Sjoberg, B. M. Suggestibility with and without "induction of hypnosis". J. Nerv. Ment. Dis. 13, (2), 204-220 (1961). Jamieson, G. A., Sheehan, P. W. An empirical test of Woody and Bowers's dissociated-control theory of hypnosis. Int. J. Clin. Exp. Hypn. 52, 232-249 (2004). Egner, T., Jamieson, G., Gruzelier, J. Hypnosis decouples cognitive control from conflict monitoring processes of the frontal lobe. Neuroimage. 27, 969-978 (2005). Derbyshire, S. W. G., Whalley, M. G., Stenger, V. A., Oakley, D. A. Cerebral activation during hypnotically induced and imagined pain. Neuroimage. 23, 392-401 (2004). Derbyshire, S. W. G., Whalley, M. G., Oakley, D. A. Fibromyalgia pain and its modulation by hypnotic and non-hypnotic suggestion: an fMRI analysis. Eur. J. Pain. 13, 542-550 (2009). Casiglia, E., et al. Neurophysiological correlates of post-hypnotic alexia: a controlled study with Stroop test. Am. J. Clin. Hypn. 52, 219-233 (2010). Raz, A. Attention and hypnosis: neural substrates and genetic associations of two converging processes. Int. J. Clin. Exp. Hypn. 53, 237-258 (2005). Mendelsohn, A., Chalamish, Y., Solomonovich, A., Dudai, Y. Mesmerizing memories: brain substrates of episodic memory suppression in posthypnotic amnesia. Neuron. 57, 159-170 (2008). Raij, T. T., Numminen, J., Närvänen, S., Hiltunen, J., Hari, R. Brain correlates of subjective reality of physically and psychologically induced pain. Proc. Natl. Acad. Sci. U.S.A. 102, 2147-2151 (2005). Raij, T. T., Numminen, J., Närvänen, S., Hiltunen, J., Hari, R. Strength of prefrontal activation predicts intensity of suggestion-induced pain. Hum. Brain Mapp. 30, 2890-2897 (2009). Röder, C. H., Michal, M., Overbeck, G., Gvan de Ven, V., Linden, D. E. J. Pain response in depersonalization: a functional imaging study using hypnosis in healthy subjects. Psychother. Psychosom. 76, 115-121 (2007). Schulz-Stübner, S., et al. Clinical hypnosis modulates functional magnetic resonance imaging signal intensities and pain perception in a thermal stimulation paradigm. Reg. Anesth. Pain Med. 29, 549-556 (2004). Holroyd, J. C., Nuechterlein, K. H., Shapiro, D., Ward, F. Individual differences in hypnotizability and effectiveness of hypnosis or biofeedback. Int. J. Clin. Exp. Hypn. 30, 45-65 (1982). Martínez-Montes, E., Valdés-Sosa, P. A., Miwakeichi, F., Goldman, R. I., Cohen, M. S. Concurrent EEG/fMRI analysis by multiway Partial Least Squares. Neuroimage. 22, 1023-1034 (2004). Frischholz, E. J., Tryon, W. W. Hypnotizability in relation to the ability to learn thermal biofeedback. Am. J. Clin. Hypn. 23, 53-56 (1980). Engstrom, D. R., London, P., Hart, J. T. Hypnotic susceptibility increased by EEG alpha training. Nature. 227, 1261-1262 (1970).